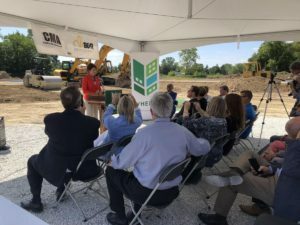 Groundbreaking: Construction Begins at Whitetail Ridge in Paddock Lake - Kurk, Inc.
We’re happy to be working with our friends at CMA and Bear Development on the latest WHEDA Project in the Village of Paddock Lake: Whitetail Ridge. 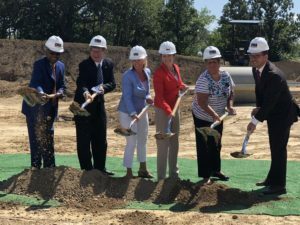 The groundbreaking at the Whitetail Ridge senior and multifamily development in Paddock Lake on Thursday August 23rd, kicked off the construction of 50 senior apartments, 10 townhomes, and new single family home sites in Kenosha County, WI. Not only does the Whitetail Ridge Development fill the housing need in the area, it also fills the void left open when previous development plans for this site fell through. With the new housing available, Paddock Lake sets itself up to spur future development in the area. Lt. Governor Rebecca Kleefisch attended the ceremony in support of an announcement of more than $6.6 million in state housing tax credits to help fund nine projects statewide. A portion of the Whitetail Ridge Development was made possible and is supported by a 2017 federal housing tax credit. 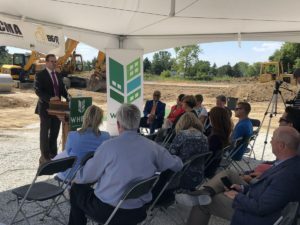 “Through our partnership with WHEDA, we have eight projects in the state of Wisconsin right now, totaling 658 new homes for hard-working families and seniors,” S. R. Mills, president of Bear Development said. Two of those are supported by 2018 tax credit awards. Five are in Kenosha County. “The goal for the project (in Paddock Lake) was not only to create some really high-quality housing, but really to have this development act as a catalyst,” Mills said. Are you looking for a concrete contractor for your next multi-family construction project? Find out more information about our commercial building foundation services today. Blog & News Coming Soon!